The hippopotamus or common hippo is one of two living species of hippopotamus. 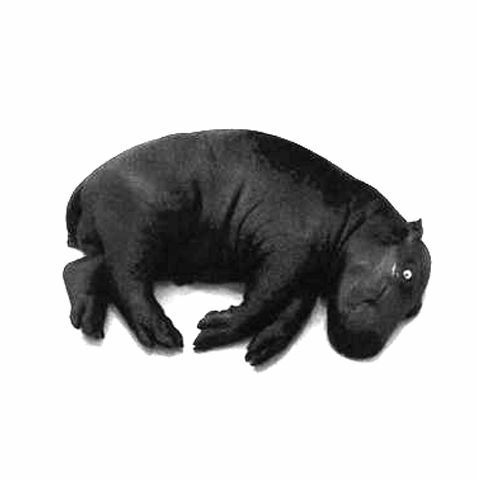 The hippo belongs to the family of Hippopotamidae. The other hippo is the pygmy hippo. This is one of the heaviest terrestriam mammal species, after elephants and rhinos. The hippopotamus is a large mammal living in sub-Saharan Africa. After the elephant and rhinoceros, the hippo is the third-largest type of land mammal and the heaviest extant artiodactyl. Despite their physical resemblance to pigs and other terrestrial even-toed ungulates, their closest living relatives are cetaceans (whales, porpoises, dolphins). They can run faster than a human on land. It can load at a speed of 30 km/h maximum. The hippopotamus is a semi-aquatic herbivorous. It spends its days in groups of twenty individuals in the soft and muddy water. Its mass can be up to 4 tons, due to its large mass and because it does not have sweat gland it is very sensitive to heat. It can close its nostrils and stay completely immersed up to 30 minutes. It floats and is very skillful in water. It also feeds on land, particularly at night. It eats up to 50 kg of vegetation per day. Eyes, ears and nostrils of the hippopotamus are placed so as to emerge on the surface of the water. They spend most of the day with their bodies submerged in water, their skin secretes a kind of reddish natural sunscreen sometimes called “blood sweat,” but it is actually not of blood, nor sweat; this acid has an antimicrobial role. Its incisors can be 60 cm lengh. Its jaw can open up to 150 °. Its height at the withers is about 1.5 m and it can measure 3.5 m in length. The male delimit their territory by projecting feces and urine.They live in groups of up to 40 counting heads. Females reach sexual maturity at 5 or 6 years old and have a gestation period of 8 months. A male hippo often marks its territory along a bank of river where it keeps its harem of females. In deep water, they usually propel by leaps, pushing on the bottom. Their lifespan is 40 to 50 years. The hippopotamus is one of the most aggressive and unpredictable creatures in the world and, as such, ranks among the most dangerous animals in Africa. Nevertheless, they are still threatened by habitat loss and poaching for their meat and ivory canine teeth.